Ravi Bopara racked up his fourth first-class hundred in consecutive matches while Paul Collingwood and Matt Prior chipped in with useful half-centuries, as England completed their Ashes preparations with a quietly dominant final day against Warwickshire at Edgbaston. After rain delayed the start until 2.15 pm, England batted on for just over an hour and then whittled away three wickets in 12 overs before agreeing to a finish at the earliest possible time of 5.00 pm. It was an unsatisfactory end to a contest that was as far removed as possible from the dogfight taking place down the road at Worcester, and quite understandably there was a chorus of boos from the smattering of spectators who hung around to watch the action. But this match hadn't had a properly competitive edge since the first day, and the prospect of putting the feet up and watching Andy Murray's semi-final tussle at Wimbledon was clearly more alluring to England's cricketers. Relaxation, after all, will be vital to their performance in the coming days. "Everyone is pretty relaxed and everyone is playing well," Bopara said. "The way our bowlers played here gives them confidence, and gives the batters confidence as well. We coped well on this sort of deck and we are very relaxed. Everyone seems chilled but working really hard. Everyone has been in the nets and in the gym getting ready in every possible way, whether it is strength, fitness or technique, so we are ready for Wednesday." Bopara didn't give any impression of mounting nerves whatsoever. He resumed unbeaten on 88, and duly went to his hundred from 153 balls with his first lofted shot of the match, a cover-driven six into the Tom Dollery Stand. 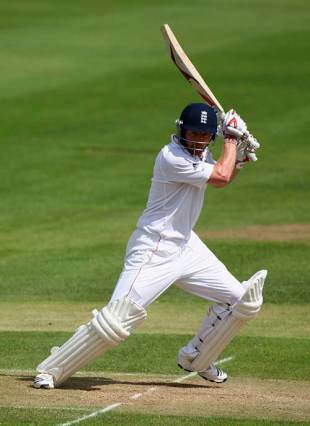 He retired his innings at the end of the same Boyd Rankin over, whereupon Collingwood and Matt Prior took the team along to an imposing 319 for 3 at tea, after which Andrew Strauss declared to give his fast bowlers one final gallop before Cardiff. Chasing a nominal 508, Warwickshire lost their captain, Ian Westwood, for 5 to a good length lifter from Stuart Broad that was edged to the keeper, and when Jim Troughton was crassly run out in the same over for a second-ball duck, there was the brief suspicion that England might push for a quick victory. That prospect became all the more likely when Andrew Flintoff induced an edge to Andrew Strauss at first slip to remove Ateeq Javid for 3. But then, out of the blue, quite literally for the sky was totally clear, the teams decided to shake hands, and that was emphatically that. "It has been a good little run-in to the first Test," Bopara said. "The boys got a hit and the bowlers bowled well, and looked on fire with the ball. We're happy all round. The standard wasn't as high as next week, but there's nothing better for a cricketer than spending time out in the middle. As a batsman you can work five days a week for five hours in the nets, and it is not the same as going out in the middle." Perhaps the most meaningful preparation for England's cricketers came from watching the TV in the dressing-room, where Steve Harmison's rattling of the Australian batsmen, and Brett Lee's impressive spell of reverse-swing, were being beamed in live from Worcester. "Lee bowled really well," said Bopara. "He got it swinging both ways, and that is a lethal combination if you get it right. Hopefully it will not happen at Cardiff, but if it reverses for them then it will reverse for us. But there are not many ways you can work on reverse swing as a batter. You have to let your natural instinct take over. If you are an international batter, then you should be good enough to cope with it." Bopara has at least had his recent tussles with Fidel Edwards to prepare him for Australia's extreme pace, while his own memories of Cardiff are pleasant, having scored a century for Essex - against Simon Jones among other bowlers - on a previous visit in 2006. "I enjoy playing there," he said. "It is a decent deck which turns as well, which is helpful. I scored a hundred three years ago, when Jones was reversing it towards the end of the day. He bowled with good pace, and when it started reversing it did seem a lot quicker."